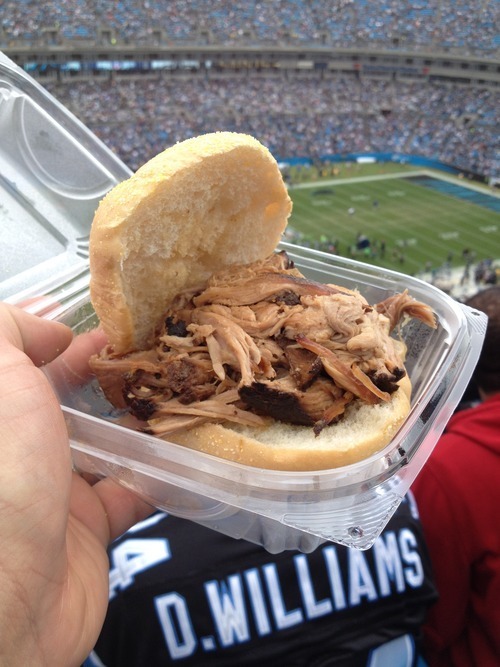 Monk: Speedy and I are in the second year of being Carolina Panthers season ticket holders, so I figured we should at least check out the lone barbecue option at the stadium even if expectations weren’t very high going in. 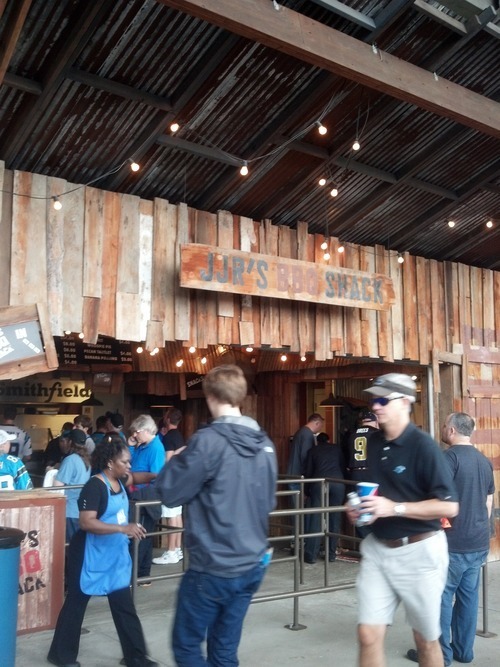 So for the last home game of the regular season, we decided to finally check out JJR’s BBQ Shack, named in honor of Jerry Richardson, founder/owner of the Carolina Panthers. And it came out about as expected. 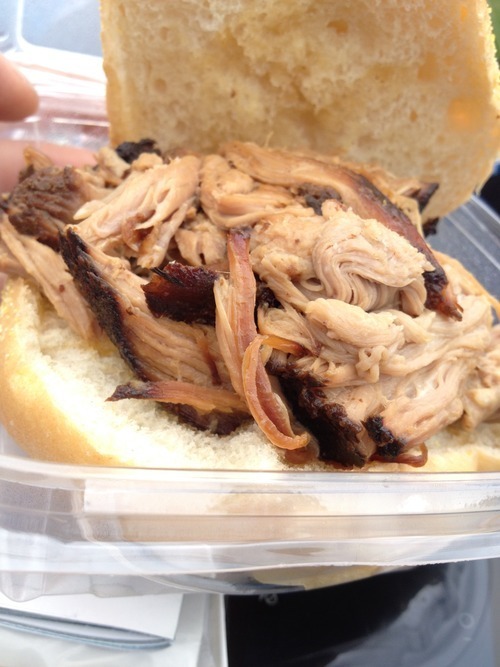 The pork, while it did have a good texture to it, lacked moisture and smoke, even in the bark. It absolutely required additional sauce from the condiments area of the concourse, which I neglected to add before heading to my seat. Speedy, I know you don’t have much more to add, but what say you? Speedy: For my order, I initially asked what the “double stack” was, assuming it was a combo brisket-pork sandwich. I was told by the guy up front just to order it, only to find out that it was really just a pulled pork sandwich with extra pork, bacon, and nacho cheese. Due to my intolerance of dairy, my desire to avoid cardiac arrest, and the fact that it looked disgusting, I quickly backtracked from the order and switched to the normal pulled pork sandwich. Monk’s description above is spot on – there’s not much more to say about it. 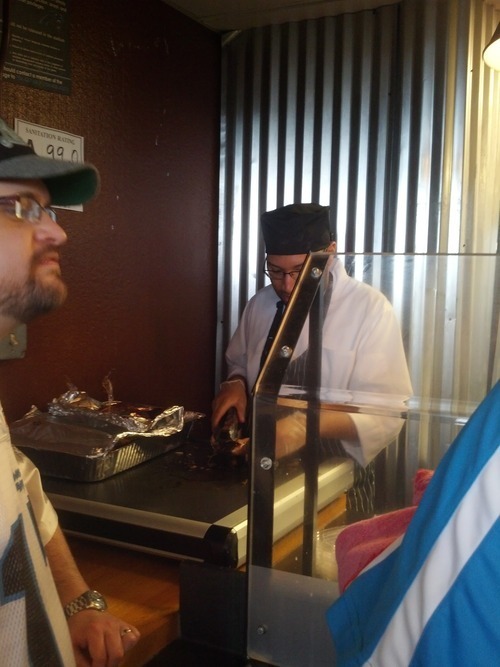 I did have a bite of Papa Speedy’s brisket sandwich, which I thought was slightly better. It came sliced and lightly sauced, which I think was the difference. Still though, I won’t be rushing back to try it again. Speedy: …Monk and I might just have to make our own ‘cue. Until then, keep pounding! Disappointed in your nachos at the Panthers games. Not nearly as much ingredients as in past seasons. 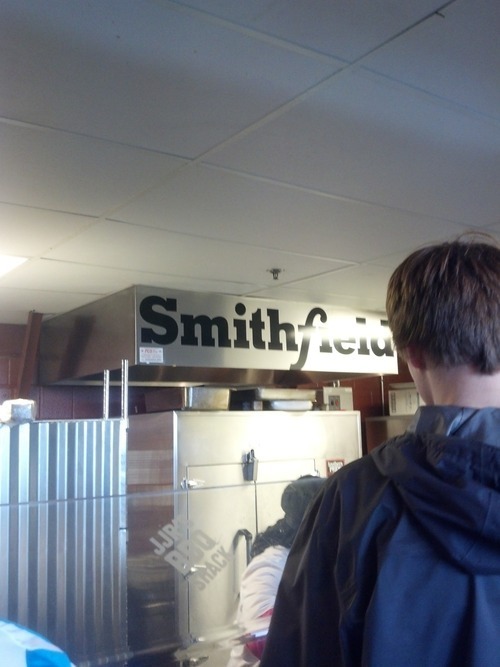 You’ve always been my favorite concession. After the last two stops, I’ll have to find a new favorite. I’m not quite sure who you are addressing here. We reviewed JJR’s and aren’t in any way affiliated with them.